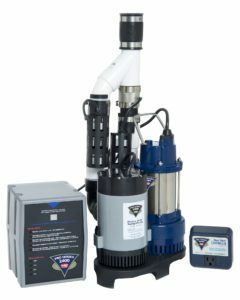 Sump Pumps, Backup Pumps & Alarms | Wm. Masters, Inc.
Having a basement in the Midwest requires having a system in place to protect it. Since basements are located beneath the ground, they are surrounded by water. A compromised system can result in a flooded basement, costing thousands of dollars in cleanup and repairs, and rendering this space of your home unusable for a period of time. To have a proper system to protect your basement from flooding, a sump pump, backup pump, and alarm to alert you of any potential issues are recommended. Whether just one of these components needs to be replaced or repaired, or you believe you may be in need of all three, Wm. Masters can give you a proper diagnosis and cost estimate before work is started. If your basement is flooded or you suspect your basement may be at risk for flooding, please give us a call today to keep your basement dry and home protected. Sump pumps are designed to keep basements and the direct area under a building dry to protect against flooding. When water from natural migration or a storm fills a sump pit, the sump pump literally pumps water out of the pit to a safe area away from the perimeter of your home. Your house is most at-risk of flooding in a storm. Unfortunately, storms also bring additional dangers, including power outages. If you lose power for an extended period of time, your sump pump will not be able to pump water away from your home, leaving you exposed to potential flooding. By installing a backup pump, you can protect your basement during power outages. They require no electricity and are fully automatic. A backup pump is an investment in your home that can prevent significant damage and hassle. Installing an affordable sump pump alarm will allow you to be notified the instant your basement and home are at risk due to a power outage or water buildup. Using PitBoss, a battery powered wireless alarm system, you can receive immediate text messages to notify you of a power outage so you can protect your home. Don’t wait for the next storm to call Wm. Masters. Make sure you have a sump pump system in place that is strong and reliable enough to keep your home dry and protected. Contact us today or email us now by visiting our contact page. We look forward to serving you and bringing peace of mind to your family.